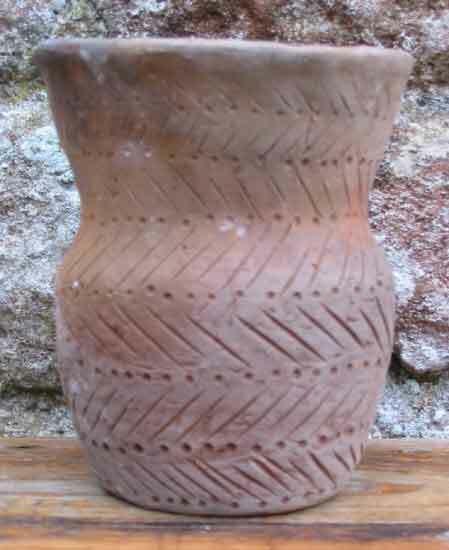 Bill runs sessions for people to try their hand at making Bronze Age Beakers and Urns. The sessions can take many formats, according top the requirements of the students. *Preparing the clay - Bill can provide ready to use clay, but it is interesting to see what goes into the raw clay. Participants are encouraged to bring their own clay, if they can find some locally. 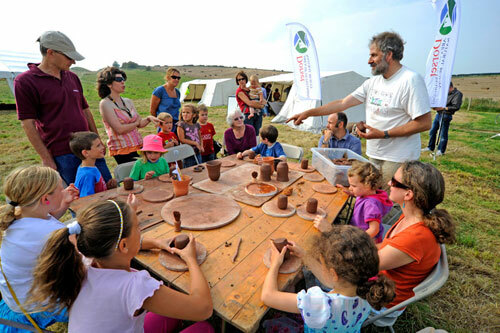 *An overview of the Bronze Age Pottery traditions. It is useful if people have visited a Museum before coming so that they have seen some real ancient pottery. The Dorset County Museum is highly recommended. Bill running a beaker making workshop at the Bronze Age Festival at Maiden Castle in September 2009. People are encouraged to make more pots "at home" after the first session and bring them to be fired. The second session is the firing of the pots, when they are dry - a couple of weeks after they are made, but sometimes there is a longer wait for a suitable firing day. A bonfire or clamp is used to slowly preheat and then fire the pottery, over about 8 hours. Alternatively Bill will simply fire the pots made at the first session in an electric kiln and they can be picked up at a later date. The sessions can be staged when and where convenient - individuals will be invited to come to a session when there are enough people wanting to do it. Groups can negotiate their own activities and locations. Sessions can be run at the Upwey Old School Hall, or in the comfort of a group's own venue. The bonfire needs a space about 4 metres square minimum, with the turf removed (if precious!). Bill will roam afar if travelling expenses are paid. Bill is happy to work with people of all ages and abilitities, but each child must be accompanied at all times by an adult guardian (at a ratio of not more than 3 children per adult), the adult must also join in! He would like to charge more rather than less for teaching children! Participants will be able to keep the pots they make, but no guarantee is given that they will be in one piece! Pots that Bill has made will be available for sale. Bill tries to make a living as a professional potter, so charges have to be made, think what a plumber or car mechanic charges and then negotiate accordingly! Contact Bill by email to arrange your session.